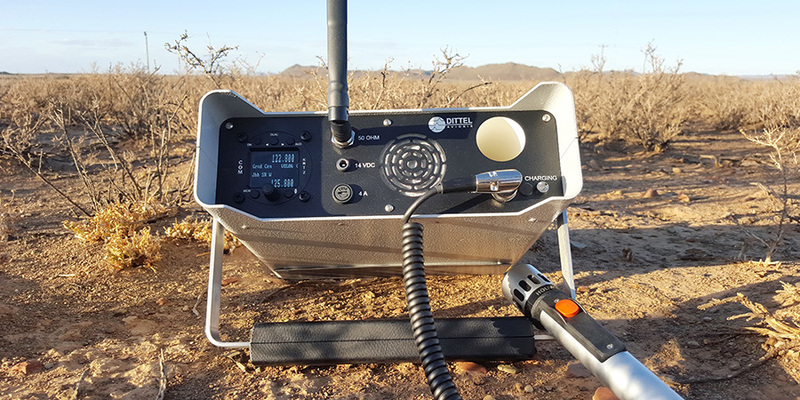 The DITTEL/TQ KRT2-TB2 portable is the follow-on to the very successful TB1 and a vast improvement over the old yellow FSG series. . Developed by PJ Aviation in South Africa with higher local content, stronger, yet simplified construction, easier servicing, modern design and convenience of use. Reduction in weight without compromising strength was a major goal in the development and this was achieved with optimum use of a combination of high strength corrosion resistance alloys. Accuracy of dimensions and fits is achieved through the use of CAD/CAM in a highly automated facility in Johannesburg. The TB2 housing has no plastic outer case. The alloy used in the outer shells and face is resistant to salt water corrosion and denting. A high quality powder coating is applied to the shells and face plates. The light grey/black colours are standard, but users placing high volume orders may choose their own. The handle is polished stainless steel bar, and a polished thin stainless steel cover clips over the face plate to provide a protected storage area for accessories during transport. This stores underneath during operation. Particular attention has been taken regarding the security of the battery during transport and rough use. Yet removal and replacement is an easy task. Battery charging on a portable has to be optimum to provide the longest operating times in the field. Merely charging to 13,8v does not achieve a full charge and long battery life. The TB2 uses an automatic charger with a 2A constant current characteristic to 14,6v, equalizing the cells, and then dropping back to a 13,8v trickle. For world wide universal use, the mains charger is rated for 100 to 240VAC 50 or 60Hz. Mains charging status is indicated on the face plate with a bi-colour LED. To de-clutter the face plate, the mains charging socket is fitted at the bottom of the case. External 14VDC charging sources can be connected to the current limiting external DC charging connector. The battery voltage may be read on the KRT-2 radio’s Display. The standard battery is a LiFePO4 typewith internal BMS, deep discharge and short circuit protection.Compared to a sealed lead battery this battery increases the operating time significantly, recharges much faster and ensures a minimum of 6W carrier output on battery power alone (not possible with a lead type due to the lower voltage) and reduces the portable’s overall weight by 20%. The battery change interval is trebled compared to a lead type. This battery is required when the KRT-2 radio is loaded with special firmware for higher carrier power. The loudspeaker is a waterproof mylar cone type. A dynamic microphone is provided, but a speaker-microphone may be ordered instead. An extra socket can be provided for ATC recording equipment, on request. The professional model utilizes a metal tubular microphone which stows inside a tube through the face plate. Headsets with in-line PTT switches are also available. The antenna on the professional version is a flexible steel blade type with swivel joint, allowing the TB2 to be used upright or propped up on its handle on a desk. External co-linear antennae and compact telescopic masts are available on request. Please specify length of coaxial cable required. Internal mains charger with LED indication. Customer provides own external charger. Holmco dynamic tubular microphone supplied Dynamic fist microphone supplied. Steel blade antenna with swivel base supplied Helical or whip antenna supplied. Stainless steel transport cover supplied Stainless steel cover not included. 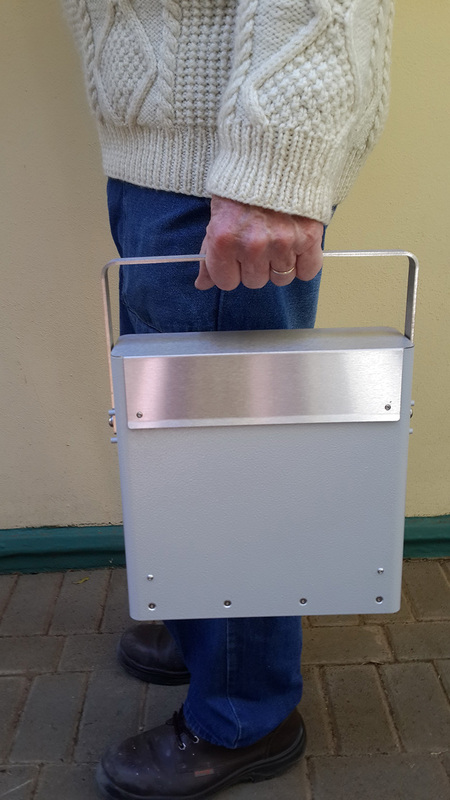 Size approximately 250mm high, 254mm wide and 85mm deep (excludes handle). All screws in stainless steel. Full graphic LC-display allowing easy use under all light conditions including bright sun light. Display illumination can be dimmed or turned off. 33 kHz and 25kHz channel spacing, for future compatibility. The Dual Watch mode that allows monitoring of two different channels, with priority. 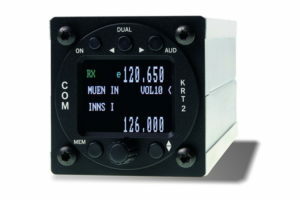 RS232 remote control facility provided for. Optional remote control unit available. Memory for up to 100 user-definable named frequencies. Single knob for easy gloved hand operation. Digital readout of battery voltage. Operation normally on 13,8VDC. Automatic system test, including antenna matching, on switch on. Adaptive squelch automatically ensures weak signals are always received. During transmit, a bar graph confirms modulation and antenna match. Loudspeaker audio output up to 10w (5W on internal speaker). 5w loudspeaker on front panel (can be disabled). External loudspeaker connections on rear panel. N-type female bulkhead antenna connector on rear panel. Handles provided on front plate to aid mounting. 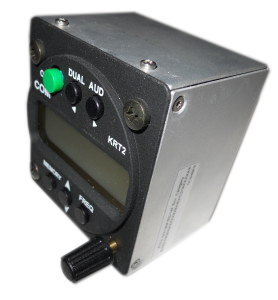 The KRT2-19-25 is a 25 watt fixed base station designed for small airports, helipads, airlines, oil rigs, etc. 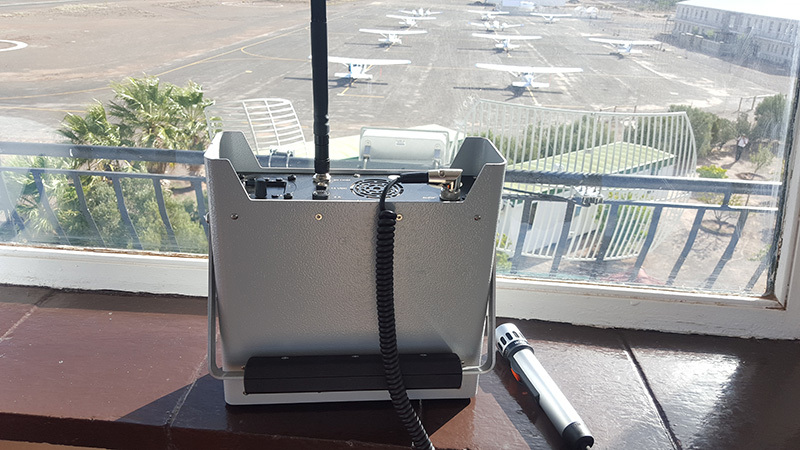 Developed and manufactured in South Africa by PJ Aviation, the base station employs the KRT2 transceiver module by TQ Systems (originally developed by Dittel Avionik). A high performance, wide band, linear amplifier increases the output carrier power from 5w to 25w. Transmit/receive switching is automatic, requiring only a single antenna. In the event of a PA or antenna fault, the transmitter output is automatically reduced to 5w. Full graphic TFT colour display allows easy use under all light conditions including bright sun light. 8,33 kHz and 25 kHz channel spacing, for future compatibility. Dynamic fist microphone is supplied. Optional headset or desk microphone with PTT button or foot switch is available. The Dual Watch mode that allows simultaneous monitoring of two different channels, with priority. Adaptive squelch automatically ensures that the weakest signals are received in the installed interference environment. RS232 remote control facility provides optional remote control using a similar looking control head. External rear audio connection is standard. Memory with up to 100 user-definable named frequencies. Digital readout of power supply voltage. Tx Protection: Open circuit, short circuit, high VSWR, stuck PTT. Loudspeaker audio output 10w (limited to 5w with internal speaker). 2U size, 300mm deep, black powder coated mild steel with removable face and top cover. Spot welded construction controls earth currents during Tx. 5w loudspeaker on front panel with On/Off switch. Handles provided on front plate to aid mounting and provide protection. High efficiency internal switch mode power supply with automatic internal fan and extremely low ripple, hum and RF interference. Rear cooling fan automatically controlled by PA heat sink temperature. Internal cooling slots on case sides only, to minimize dust entry.